Even the outside of the Old Colorado City Library inspires you to read. 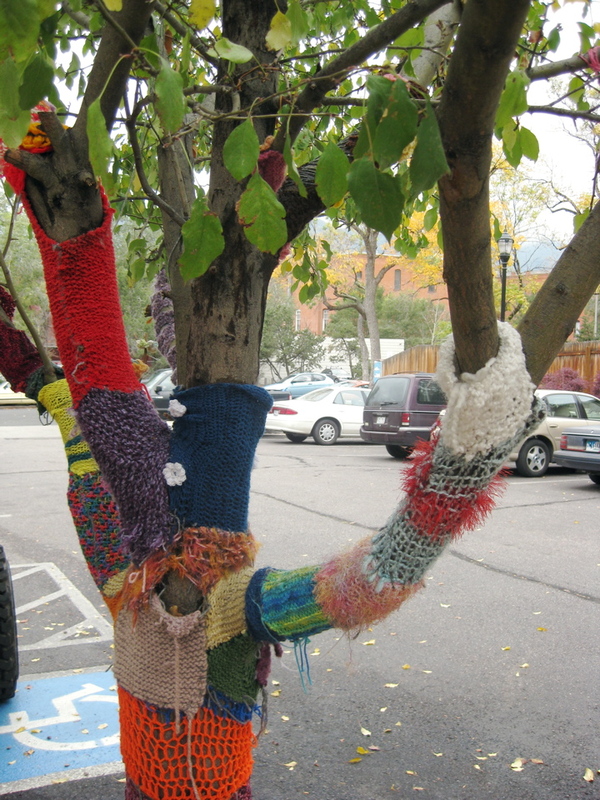 Local knitters keep the library trees colorful, creative and warm. For Mother’s Day one year, I gave Mom a deck of cards for writers. 52 cards, not for playing poker or bridge or any card game, but for picking a writing prompt. The idea was to “play your best hand” and write without stopping for fifteen minutes. Library bulletin boards are fascinating sources of information. Last week when I returned some library books, there were coupons for the nearby coffee shop, note cards with job opportunities, and contact numbers for poets looking to start a group. There was also one yellow card thumb-tacked to the board, with the word TOSKA printed in large letters. I read this message again, almost feeling my mother’s presence. If it weren’t for her dementia—and even though I doubted she had ever heard the word Toska—I knew she had helped many others by sitting beside them, holding their hands and listening. Take that, Toska! 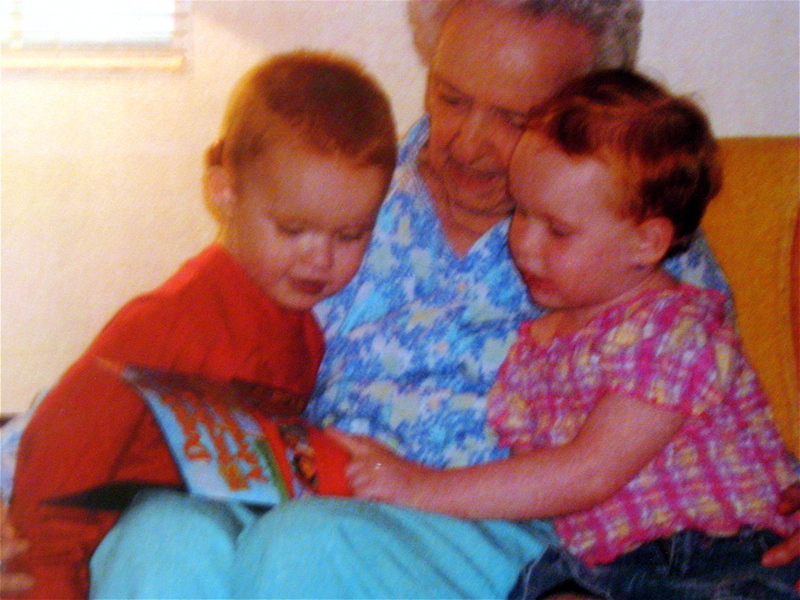 Before the dementia, Grace and Gannon often enjoyed being read to by their great-grandmother. What a wonderful touching post. Libraries have always been one of my favorite places. We have a wonderful new library within walking distances. I think each day we need to remember to be kind and caring. 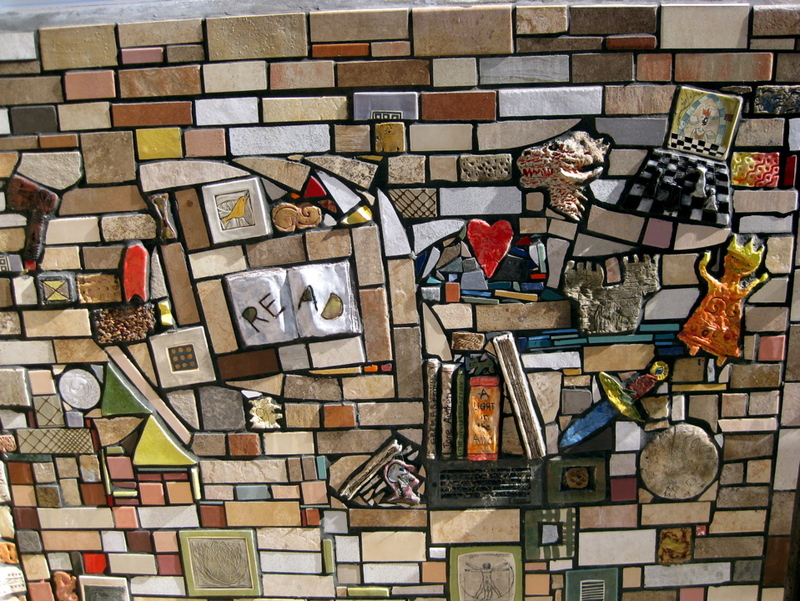 I love to walk to our little Old Colorado City Library, Gerlinde. The route takes me through very old neighborhoods where young families are updating houses and making new homes. I can spend hours reading new magazines and searching for great books to check out. Then I’ll go across the street and have coffee and talk to friends who work there…and then go back to the library. It’s a relaxing mini-vacation for me. And the TOSKA card on the bulletin board this time was an excellent reminder. It’s tragic that in this digital age fewer and fewer people use or need a library. I spent most of my childhood in our local Andrew Carnegie Library. Even grew accustomed to the ghost who inhabited the stairwell. I think I’m feeling toska-ish lately. In all seriousness. I know your mother would have patted my hand or put an arm around my shoulder. You’ve made me feel nostalgic this morning, Marylin. I used to love my library visits but am ashamed to say that I very really visit our public one these days. I spend a deal of my school time in the school library, trying to engage pupils in the love of reading so I don’t feel totally guilty. I think I may just have to pop into our town’s library…if only to check out that notice board! I remember those days so well, Jenny. Now that I go to public libraries alone instead of taking students to school libraries, the experience is so much calmer and relaxing. 😉 I hope your UK bulletin boards are a wonderful mix of helpful information and surprising opportunities…and you have a coffee shop (or tea parlor?) across the street for taking breaks. Happy Mother’s Day, Jenny. Thank you for this. It is both heartwarming and inspiring. Thank you, Anne. Please join us again. Your title was a nifty teaser, but regardless of your titles I look forward to gobbling up whatever I find here. The bas relief on the library photo is unique. Jacksonville’s library features a large owl high on the roof holding a golden key. A huge stuffed Curious George sits inside the library in the children’s department. It looks “loved” enough to have been the same one my children caressed. I like that the word Toska expresses such a wide range of feelings. Is it from a specific language or possibly an acronym, I wonder. Happy Mother’s Day to you, Marylin. Hi, Marian. I love the image of an owl holding a golden key, but this little library has no extra space at all, so a huge Curious George is out of the question. Toska isn’t an acronym. I looked it up; it’s a Russian word that has many more examples of sadness, loss, need, confusion, so I just stayed with the information I found on the yellow card. It was a happy, clappy day, no TOSKAs – feeling blessed right now! I so agree with you Marylin. Libraries are places of refuge, of wonder and they exude a welcome not unlike home. More than in some cases. It’s a diner for the mind. A diner for the mind. Ah, yes, David, that’s a library! Before her dementia, my mother did have such good intuition for what people needed–especially a listening ear and a comforting hug–and even now there are moments when she still senses it in people who come to care for her or visit her. I love libraries, too, and as you’ve discovered, you can find all sorts of things there. I still remember my mom taking me and my sister to the library in Dallas when we were little, and I took our daughters to the library every week when they were young. I can certainly verify that my Marylin’s passion for libraries has continued to present day. Here is just one example: there we were recently in the shadow of the majestic Sangre de Cristo mountains near Westcliffe, Colorado. It was our first “get-away adventure” in quite some time. The 4X4 roads which climb deep into this glorious mountain range beckoned us in Marylin’s off-road capable FJ Cruiser. Do we heed the call of the mountains? Nope. Marylin says, “I wonder if Westcliffe has a library.” They did. Guess where we were for the next three hours??? Gotta love you and your quirky library habit, sweetie. You are always my knight in shining armor, sweetie. And it turned out to be such a nice library, tucked in between two story older buildings selling art and mountain gear. My goal will be to have a heart in action forTOSKA—- thanks for giving me a word to remind me. You already have a huge heart for TOSKA, Keeta. 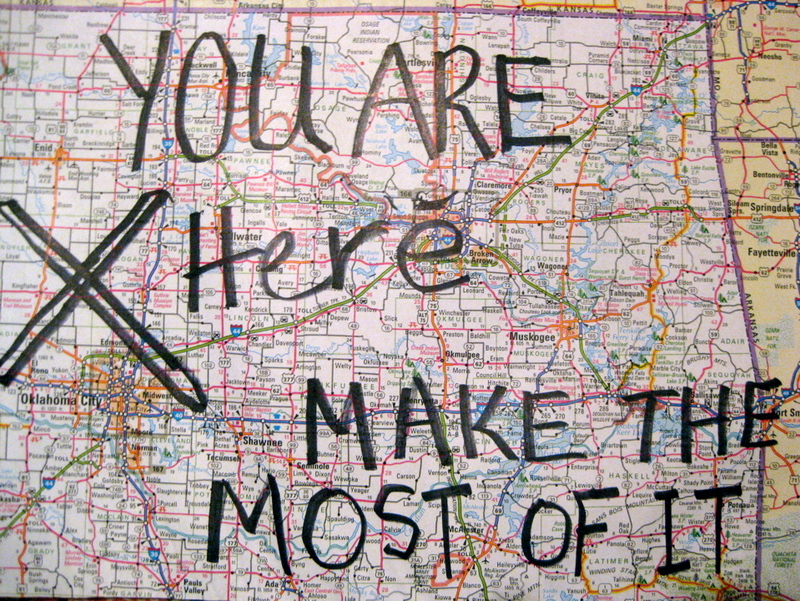 No doubt about it. I’ve seen you in action, and you and my mother have many similar qualities that make such a difference in people’s lives. Happy Mother’s/Grandmother’s Day to you, dear Keeta. I love old libraries too Marylin and the little sign about TOSKA is so fitting for mother’s day. The older I get the more I love to make someone feel better or ease their sadness. Love libraries. I still spend a lot of time in them. And yes, holding someone’s hand and listening is a gift that keeps giving. Happy Mother’s Day, Marylin. And to you, too, Diana. I’m happy to see this tribute to libraries Marylin, I go to a library every work day of course since I’m a library manager, but they’re under serious threat here in the UK, with lots closing. Libraries are a safe haven for those of us that love books. During the 2010 Olympics in Vancouver, I went down town to enjoy the festivities. It was very crowded and impossible to get a seat in any of the restaurants and coffee shops. I was getting hungry and desperate. Then I saw the library and remembered there was a coffee shop there. The place was almost empty and I got a lovely seat overlooking the street activities, enjoying my samosa and cup of tea. I was home! This is a big word! Yes, I too would be found in a library…best part of any world! Happy Mother’s Day to both you and your mom! Happy Mother’s Day to you as well! Happy Mor Mor’s day! I have been told that when I was a baby and you were taking care of me you would take me to the Library ALL the time, and that I learned to crawl there. Thanks for teaching me to love Libraries, Mor Mor! I work in a library. Lucky me! Good mother’s day memory for me, too, Marylin because my mom was a librarian and always served on the library board in Knoxville. We’re both blessed by our moms! Yes, we both are definitely blessed by our moms. You’ve done it again, Marylin . . . made be tear up. What a beautiful, touching post. And I learned another new word, TOSKA. I simply love the tree with the knitted apparel. Mor Mor! A while ago I did volunteer work at our little library here in Chapman. I was doing it as a result of some bad choices I made, but it turned out that it was a good time for me to help cuz the librarian had just had surgery on her shoulder so she really needed my help. I really learned to like our library through that time. Robyn, I love the image of a library being in an old two story home where you could find corners to curl up in and read! What a wonderful place to savor books. I’m glad this post brought back wonderful memories for you because it created wonderful new visions for me, dear friend.